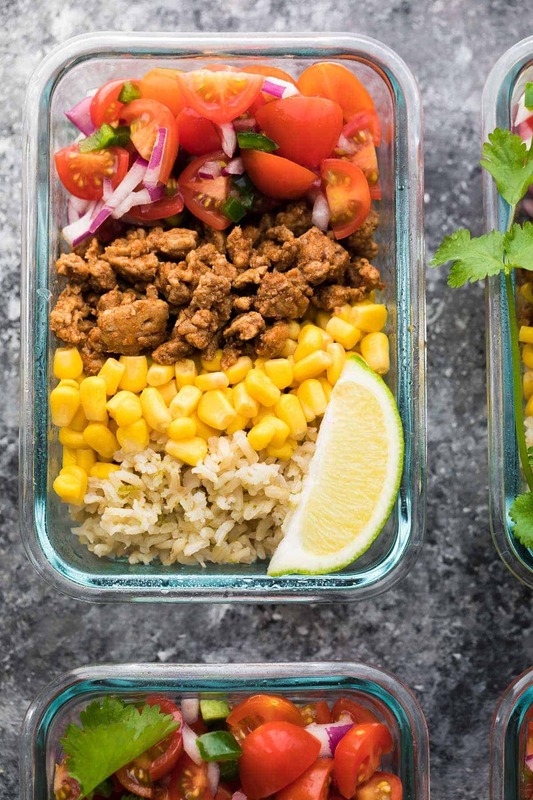 These turkey taco lunch bowls contain turkey taco meat, corn, brown rice, and a simple pico de gallo. Tons of flavor for little effort and your lunches will be ready for four days! Are there any healthy foods that you dislike? For me, it’s brown rice. I remember being so excited to embrace brown rice, but quickly became disenchanted when I realized it had to cook for forty minutes. And then even more disenchanted when I tasted my bland, dry brown rice. I think that was ten years ago and I still can’t seem to shake those memories. But I decided to give it another try, because it is far less refined than white rice and retains a ton of healthy vitamins and nutrients. That plus it takes longer to digest which means you feel full for longer after eating it. So I finally gave brown rice another try, and I’m so glad I did! Did my brown rice take forever to cook? Yes it did. But I cooked it in my rice cooker for a super hands off approach, and was rewarded with the softest brown rice! I added a touch of salt and some lime zest to liven things up. 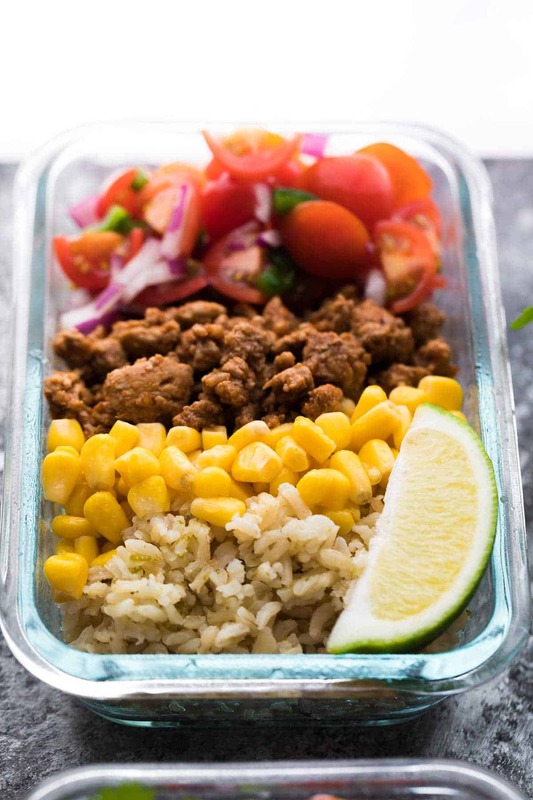 This brown rice went straight into these turkey taco lunch bowls. Maybe we could call them burrito bowls? I dunno. Whatever we call them, me likey! I cooked up a batch of ground turkey with some taco seasoning, and chopped up a fresh tomato salsa. 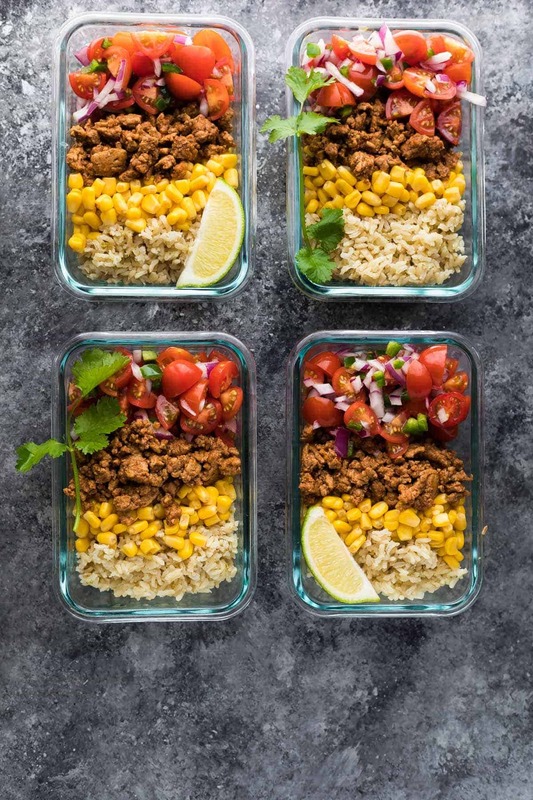 I’m often leery of make ahead recipes that contain tomatoes because they will soften a lot by day four, but I don’t mind that one bit mixed in with these lunch bowls! I completely loaded these bowls up with the tomato salsa…and some corn. Feel free to use what you have in your fridge! Not only are these bowls loaded with fresh veggies, but they are actually filling! Does anyone else get super annoyed when you get hungry an hour after lunch? I DO. add crunchy cabbage, shredded carrots, or bell peppers. Clean out your fridge! Alrighty. That’s it for today! Happy Monday! More make ahead lunch recipes for us! how about some Meal Prep Pesto Chicken Pita Pockets for your lunch? Cook brown rice according to package directions, adding the lime zest and salt to the cooking water. Cook turkey over medium heat, tossing in the taco seasoning and breaking it up as you cook. Cook for 10 or so minutes, until cooked through. Combine all salsa ingredients and toss together. I just made this yesterday to take for lunch the rest of the week. I just ate my first one and it was DELICIOUS! So glad you enjoyed, Jamie! I tried these swapping Turkey out for Quorn and it was great! Recipe made 4 so I ate one fresh and have 3 lunches backed up for the week. Recipe is tasty and the layout looks really beautiful. So happy to hear that! Thanks for reporting back, Eleanor! 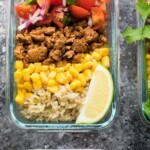 This recipe is in my top 5 all time favorite lunch meal prep. The flavor is wonderful and I feel full after I am done eating it. Very simple to make I just love it and I can’t say that enough. Wow, I’m so happy you enjoyed it so much, Tammy! This recipe was my first foray into meal-prep, which I have wanted to try doing for a while but have felt too overwhelmed to get started. The recipe was fantastic–quick and easy to prepare, and a great balance of nutrients, flavours and textures that kept me on my feet and didn’t leave me craving snacks in the afternoon. 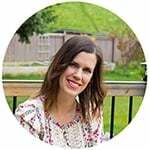 The mental relief from not having to devise new lunches for me and my husband each day was huge, and the time I saved gave me energy and enthusiasm to try a couple of dinner meal-preps too! Thank you SO much for your wonderful site, Denise. Yay Deborah! Way to go! Glad you enjoyed the recipe. Interesting recipes, they look so yummy. I can’t wait to make this recipe for my family. It’s really healthy. Do you have a video about in this recipe? That can make easy to do beter. Please see this link for safe ways to store rice and they recommend not using past one day…. Hi Sarah! I’m sorry that you experienced food poisoning, and I can see how this would make you very cautious about rice! I can assure you that if handled properly, rice is 100% safe to eat…I’ve read up to 5 days after cooking, but personally I don’t do longer than 4 days. The key is to get it in the fridge as quickly as possible, as the harmful bacteria replicate at room temperature. I have been doing this for years and have never had any issues…we even freeze rice at our house. I’m literally in the process of making these to this weeks lunch and I’m so excited to try them out! Do you re-heat it for lunch or eat it cold? I made these last night for my boyfriend and I for the week. We loved them! For a man who loves eating out for lunch regularly I was extremely pleased that he liked this healthy (made at home) lunch! Thanks!! I’ll be grabbing more recipe ideas for sure. Hi Molly! That would work. Yes, these are stored in the fridge, they are not freezer-friendly. Hope you enjoy it! I’m trying to make healthier food choices and I cannot get enough of these bowls! I made four of them to take to work for lunch. 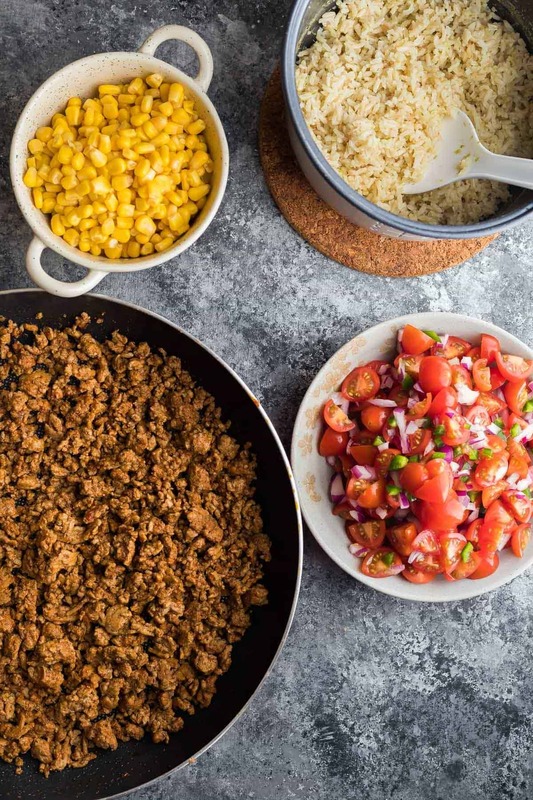 I’ve never cooked with ground turkey before and I think I’m officially converted! Thank you for sharing! I’m starting a blog (coming soon) and will be sharing your page with the recipe. LOL i totally use instant brown rice if I have to use it. I just don’t have time for full on cooking rice! This looks amazing, and I don’t know why I haven’t made these before! Anything to save a little time in the kitchen is OK with me, LOL! Hope you enjoy! I made these last night and they are so yummy! I did remove the seeds of the jalapeno and I’m glad I did it was spicy as it was. I loved it! Please keep the meal prep recipes coming. These were amazing. As a pescaterian i did sub the turkey for morningstars veggie “meat” crumbles and used bens ready rice. Great idea for food prep. Tasted amazing nevertheless. Thank you! Oops just read that it makes 4, my bad! Just bought some meal prep containers and this was the first recipe I used with them. I was not disappointed! My husband and I were so pleased with this flavorful, healthy lunch. Looking forward to having it tomorrow, as well. Thank you for the GREAT recipe! It will be on rotation! YAY! So happy you liked them Laura. I hope you enjoy your lunches all week long! I didn’t realise till I read this post how long it’s been since I’ve had tacos, this looks so tasty and I’ve never tried a taco bowl before! Just wanted to tell you that these were great! I take them out of the fridge about 30 mins – an hour before I want to eat them and they’re are delicious!!! Can you eat these for lunch AND dinner? I see everyone using this as just lunch but when I meal prep, its usually for both lunch and dinner. Absolutely, we routinely eat the ‘lunch prep’ recipes for dinners. These are great if you want to cook everything ahead and just pull them out to enjoy. Does the nutritional stats include the shredded cheese? Where does all the sodium come from? This looked great until I saw sodium amounts. Let me check up on that for you, sometimes ingredients can be ‘off’ on certain counts in My Fitness Pal. Hi there these look amazing. Want to try them out. Do you have the instructions on how to crockpot the rice? Is there a reason you use glass containers versus plastic? Hi Cassie, it’s just 3/4 of a pound, not 3-4 pounds. Sorry for the confusion! I can’t wait to try these!!! I’m always looking for New healthy recipes to meal prep. Those are my favorite containers and they last forever I just don’t microwave the tops and they look like new. I love the snapware containers, too! I use them so heavily and toss them in the dishwasher and they still snap great 😀 Thanks Mia, hope you enjoy the recipe! Found you on Pinterest. Silly question but I’m making this tonight and wondered did you cook the canned corn? Hi Krystal, so sorry for my late reply! No need to cook the canned corn as it’s already cooked 🙂 I hope you enjoy the recipe! Is it 872 mg of sodium PER BOWL? That seems like a lot for one meal. hi may be a silly question but do you microwave this with the salad in? Hi Tammy, I just heat mine gently so the tomatoes don’t get soggy, but you could also keep them out until after you’ve heated? For me, canned corn is SO GROSS! It just reminds me of school lunches from my elementary days. But I’ll give it another shot! This looks awesome! LOL well feel free to sub the corn for anything else: shredded cabbage, roasted sweet potatoes, roasted bell peppers and onions…there are a ton of options 😀 I hope you like it, Colleen! Thanks for sharing this. Love Mexican food. It looks delicious! Will try this week!?? This might be a silly question but do you microwave it with the tomato salsa? Or do you eat it all cold? I say eat it cold. like a taco salad. I am making these for lunch this week and that was my plan. I cook basmati brown rice which doesn’t take as long as regular brown rice ?Thanks for the recipe! Hey Rachael! I use these ones: http://amzn.to/2kFLHmo Absolutely love them! Try charing that corn a bit in a cast iron skillet for a change of pace. I add it to all of my tacos and southwestern salads. Yummy. I am running out today to get the ingredients for these bowls. They look incredible. Thanks. I hope you enjoy them Susan! The best way to freeze rice is right after you make it. Place a cup of hot rice in a freezer bag and seal it and place it in the freezer immediately. The condensation will freeze with the rice. When you are ready for it, place it in the microwave for 2 minutes. It will steam in the bag making the rice soft and moist. It’s good enough to eat 4 days in a row!! Just made this yesterday for this week. I’m a little “funny” about reheated meat (I don’t care for the taste) but this was delish! Glad I found something that I can prep and tastes so delicious! So glad you enjoyed it! Thanks for reporting back, Brooklyn! I started cooking brown rice in my oven a few years back and it’s been a total game changer. Because I always hated cooking it on the stove. Now it’s totally hands off! These lunch bowls look great! Oh that’s cool! I’ve never tried it in the oven but just saw a tutorial for cooking quinoa that way that supposedly made it super fluffy! Must try! Preheat oven to 375. Pour water into oven safe dish. Add butter and salt and stir until dissolved. Add rice and stir. Cover and cook for 1 hour. Remove, uncover, fluff, and let cool. I add some salt free flavouring with the butter step (chicken or beef). Do you put them in the fridge? Do they last? Hi Samela! Yes, you have to store them in the fridge, and they last for up to 4 days. I could have tacos for DAYS…and anything in bowl form is always a plus for me. I swear, all I’ve been eating is some variation of Mexican bowls for lunch everyday. These look so delicious Denise!